This written declaration appears to be made in support of Sauro's release. The individual is not named but claims to be familiar with Sauro's character and work with the Order Sons of Italy. The affidavit was sworn in Sudbury, showing Sauro's connections to communities across the province of Ontario. Recto: [t-b, l-r]: [typed] December 1st. [sic] 1940. / Mason, Foulds, Davidson & Kellock, / Barristers, Solicitors, Notaries, / Toronto, Ont. / Gentlemen:- / It is with a great deal of pleasure that I dictate this / letter which is in content an affidavit duly witnessed and signed / by a Notary or Commissioner for taking affidavits. / I have been a personal friend of Rev. Libero Sauro for / at least seventeen years and I am quite confident that his attitude / is definite ly [sic] pro-British as I have discussed the war with him on / many occasions. 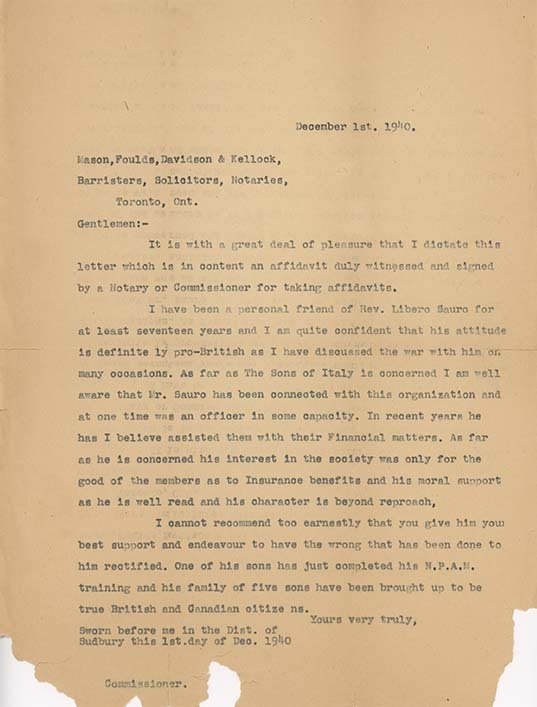 As far as The Sons of Italy is concerned I am well / aware that Mr. Sauro has been connected with this organization and at one time was an officer in some capacity. In recent years he / has I believe assisted them with their Financial matters. As far / as his is concerned his interest in the society was only for the / good of the members as to Insurance benefits and his moral support / as he is well read and his character is beyond reproach, [sic] / I cannot recommend too earnestly that you give him your / best support and endeavor to have the wrong that has been down to / him rectified. One of his sons has just completed his N.P.A.M. / training and his family of five sons have been brought up to be / true British and Canadian citize ns [sic]. / Yours very truly, / Sworn before me in the Dist. of / Sudbury this 1st. [sic] day of Dec. 1940 / Commissioner.